Left: Christmas fern - Polystichum acrostichoides; Middle: July fauna; Right: can you find the toad on the oak leaf? Some of the native bushes and small trees encountered on the trail included Spice bush – Lindera benzoin, Witch hazel - Hamamelis virginiana, Sassafras, Maple leaved viburnum and black haw - Viburnum prunifolium. However our native fauna and flora are being threatened by some newly emerging invasive species that are growing trailside and spreading into the woods, with prolific berries. Siebold’s viburnum, Viburnum sieboldii is not difficult to identify, just crush a leaf and the smell of burning tires or ripe green pepper is unmistakable and has made some significant encroachments on the Aqueduct, both trailside and into the surrounding woods. Its cousin, Virburnum dilatatum has also been showing up. The berries of the invaders are not suitable for the birds and insects; some of the berries are definitely consumed by the birds, but function as junk food, providing the wrong kinds of nutrients at the wrong time of the year, not having co-evolved with their native fauna. In addition, we have been watching over the past few years as the Chinese wisteria, Wisteria sinensis, probably planted years ago by residents of the Ottinger house which borders the OCA, has been spreading north, south, east and west, crowding out everything in its way, climbing up trees and creating almost impenetrable mats. These three species, the two viburnums and the wisteria have been classified as emerging invasive species by the Lower Hudson Partnership for Regional Invasive Species Management (PRISM). These are species that have not yet become ubiquitous on our trails, so that there is a chance we can prevent them from spreading and possibly even eradicate them from the area. Definitely worth doing if you ask me! And so in behalf of the Friends of the Old Croton Aqueduct, I made an application to the PRISM to send a NY-NJ Trail Conference Invasive Strike Force (ISF) crew to the OCA this summer to manage these particular invasive species. The application was accepted; the four person crew came in July and worked for two days with energy, commitment and enthusiasm. They used our trusty weed wrench, pulling the young trees up by the roots and in other cases, cut them down and then painted herbicide on the cut stumps to prevent them from growing back. Working admist other invasive plants such as the prickly Barberry posed challenges, so some of those had to hacked away so the crew could get at the target Sieboldii. Here are Jessica, Kasey and Jill as they worked amidst the brambles. The Wisteria vines were a challenge; difficult to trace the roots to pull them out, so the method was to cut, flag and then paint the cut stumps with herbicide; a painstaking process. The team spent almost a full day doing that. Here are a picture of a patch of the wisteria before we attacked it. Here are the red and blue flags indicating where the vines were cut; identifying them for the required treatment. The Ottinger house can be seen in the background. Here you can see a lovely Christmas fern carefully preserved so it can thrive now that it is not being swallowed up by the wisteria. Here are some piles of vines spread along the trail for the State Parks crew to chip and shred at a later date. And along the way the crew cut down some of the Burning bushes, Euonymus alatus, which we have been gradually removing from the edges of the trail in other areas, hoping to slow the spread. Here is Alex, sawing away with his hand saw. Because the OCA borders Westchester County Park property both to the west and north, (the Ottinger house sits on the west side of the trail), we coordinated with Mark Tabor, the Director of Westchester County Parks, and obtained permission to expand beyond the borders of the OCA to do our work. Counting yours truly as a volunteer and factoring in the hours worked, the ISF determined that 74 hours had been spent over the 2 days to remove 2,160 plants from 5.62 acres along the Old Croton Aqueduct Trail. Since this is seen as a multi-year project, an application will be put in for the crew for 2019. In the meantime monitoring will be done to assess what still needs to be done. Special thanks to the ISF hard working, enthusiastic crew members: Jessica J. Kathe, Kasey Lane, Jill Aldridge and Crew Leader Alex Perri. 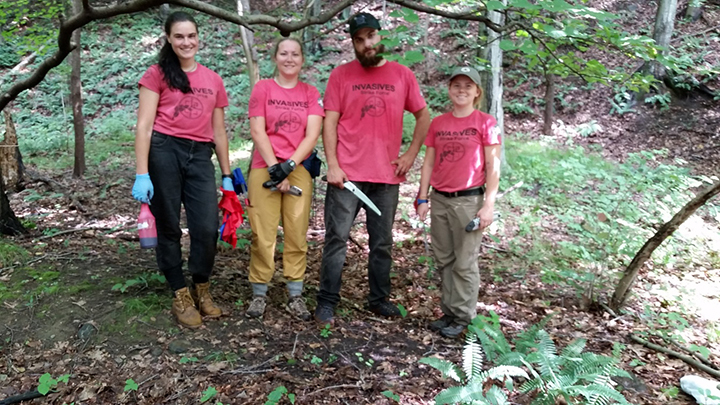 When a four member New York State Parks Invasive Species Strike Force (ISF) offered to spend a week on the trail in September; we accepted the offer and even managed to cajole two members of the NY-NJ ISF to join us for a day; the result was that many more invasive plants were removed. Here are some photos of the enthusiastic State Park crew members. Friends’ member Daria Gregg joined us for one day to provide guidance and help; I took the afternoon off. Here they are working to clear out some of our more standard issue invasive plants from a stretch of the trail we are hoping to make almost free of invasive plants: Wine berry, Euonymus, Garlic Mustard, Bittersweet, Porcelain berry, Ivy, Cardamine impatience, Privet; we even attacked the ubiquitous Japanese stilt grass in some locations with Daria’s encouragement. We worked intensively in some areas, pulling and sawing, making way for some tree saplings we discovered on the edges. The rainy weather made it easier to pull plants up by the roots. Here is the crew having completed their work removing plants threatening to invade our wildflower patch, adjacent to the Kiosk. They then made their way north to attack Wine berries and Tree of Heaven saplings that were spreading north and south of the Ventilation tower. A break for lunch on my patio and then back to work. They enjoyed making a still-life with the trash they had unearthed. And here they are posing with their tools and the pile of the Bittersweet vines they had pulled and dug up. Adding two experienced NY-NJ Trail conference Invasive Strike Force members to one of the days permitted us to expand the work we had been doing with the ISF in July in the northern section of the trai, focusing on the Tier 2 Species, especially the two Viburnum species. The leadership and expertise of Michael Young and Alex Perri meant that our efforts were enhanced exponentially; saplings could be cut and flagged by the crews and then Mike and Alex could paint the cut stumps with herbicide. Here is the joint crew with their tools of the trade. Here is one more photo of the joint crew framed by the rays of the sun. I took this photo. The rest of the photographs seen below were taken by one of our Aqueduct neighbors, Lynn Salmon, who generously came out for the day to take photographs and cheer us on. The crews were able to cut and flag many of the invasive saplings and dragged them to the edges of the trail. We kept track of the numbers as best we could and conservatively estimated that we dealt with 514 of those invasive saplings that day, some of which were thriving and starting to turn into trees. After cutting, flagging and treating some of the larger Viburnum sieboldii, we pulled them into the woods bordering the trail on the downhill side where they will eventually decompose. Notice the large number of spectacular Christmas ferns flourishing amidst the invasive saplings in this next series of photos. We expect them to continue to spread now that we can be assured that they will not be crowded out. We also decided to cut down and treat some of the giant Euynomus bushes bordering the trail; with their prolific seeds they have been dominating sections of the trail where we have not yet worked. Here is one of those bushes asserting itself just north of the ventilation tower. And here it is no more; cut and flagged; ready for treatment. The State Parks ISF members were given a special treat at the end of their week. Carl Grimm, Friends of the Old Croton Aqueduct board member, gave them a tour of the Weir chamber in Ossining, so they could have an idea what had been under their feet while they were working. Thanks Carl, for the tour and for the photo. And a giant thanks to the crew members, who worked dilligently to improve our beloved trail. From left to right: Jake Defoe, Kieran Runne, Maxwell Wermuth and Steven DiMeglio, the Eastern Species Strike Team Supervisor. So what happened to all that debris the crews left on the side of the trail? Most of it was mowed and chipped by Tony Failla, State Parks crew member during routine maintenance of the trail. Then one fall day I was out on the trail and hitched a ride with Thomas Kearney, one of our State Parks staff members. He and I picked up the remaining trailside debris, put it in the truck and Thomas hauled it away. I took this photo. Finally, one rainy day late this fall I walked the trail, hunting for any fruiting Viburnums we might have missed. I found one spectacular Viburnum dilatatum, cut it down and later bagged all of the berries to put in the trash so that it could not propagate itself on the trail. Don’t worry; I arranged to have it treated later in the season; it will NOT grow back. Photo by Pablo. That is all for 2018. Except that our application for the Trail Conference Invasive Strike Force has been submitted for 2019. We anticipate a positive response; fingers crossed. In the meantime plans are well underway for our 2019 May 4 I Love My Park Day during which we look forward to clearing more space for native wildflowers, and even planting some. Stay tuned. Here is photo I took of a medly of goldenrod, asters and ferns found on the trail this fall. We hope to find many more wildflowers on the trail as we make room for more of them to flourish.